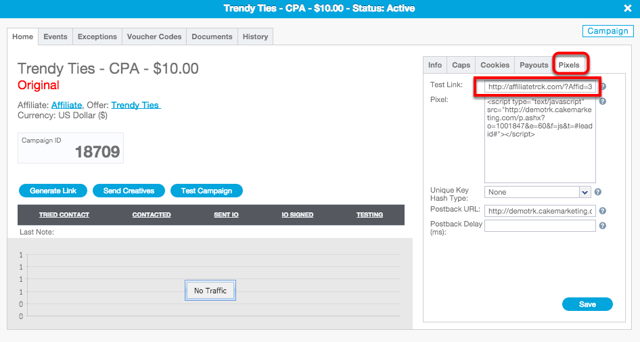 This article will show you how to test a Campaign in CAKE. Once you have setup your Campaign, you will want to test the ability to track a click and conversion. 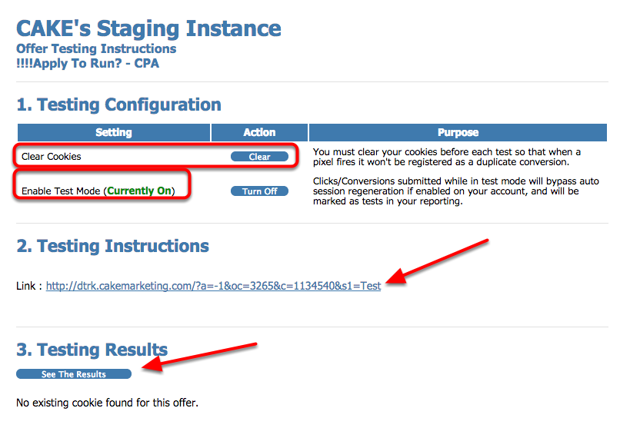 The Test feature allows a Cake Client to ensure that the Conversion Pixel has been placed correctly by the Advertiser. There is a Test button located on the Home Tab of every Campaign. Before testing, you will want to verify that your Advertiser has placed the conversion pixel on the page where the conversion takes place. Once verified, click the Test button. When you click the Test button from the Campaign card, you will be redirected to a new page that will have Testing Instructions. - Testing Link - This is the unique link you can click on to test the offer. Once you have clicked the test link and converted on the Advertiser's page, click the "See The Results" button. Click Info will show the Date Clicked and the Total Clicks. After you have placed your pixel with the Advertiser and your Affiliate has placed their pixel with you, you will want to test to make sure everyone is tracking properly. Once you generate the unique CAKE link for your affiliate, they place this link in their system and generate links for their affiliates. They can place one of these links in the 'Test Link' box on the Campaign card (Affiliate can do this via the Affiliate Portal). 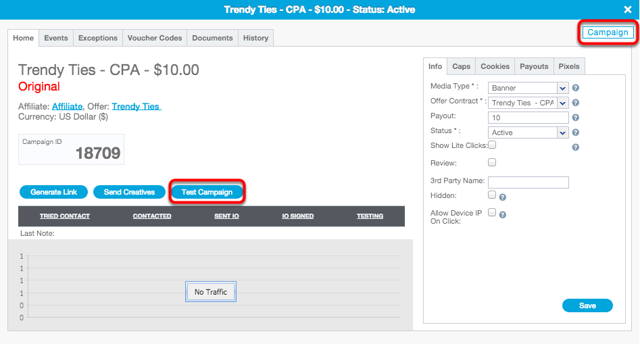 Upon clicking, the user is routed to the Affiliate's tracking system to register a click, then redirected through CAKE to register a click before arriving at the offer link. Upon completion/conversion of the offer, the Advertiser will fire the CAKE pixel and CAKE will fire the Affiliate's pixel. A conversion will register in both systems.